One of the most powerful and longest-serving City Council members in Chicago history appeared in federal court Thursday on a charge that he tried to shake down a major fast-food restaurant chain seeking city remodeling permits. 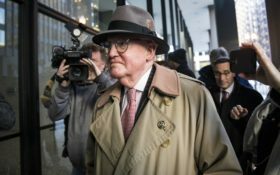 Alderman Ed Burke, 75, is charged with one count of attempted extortion for conveying to company executives in 2017 that they’d get the permits only if they signed on as clients at Burke’s private property-tax law firm in Chicago, a 37-page complaint unsealed on Thursday says. For many Chicagoans suspicious of dealings behind closed doors at City Hall, Burke has personified the city’s machine politics for decades. Dozens of aldermen have entered U.S. District court on corruption charges, but Burke seemed too powerful, too wealthy and too savvy to land himself in the kind of legal trouble he now faces. He sat in a packed Chicago federal courtroom Thursday afternoon with his arms folded, wearing his trademark pinstriped suit with a pocket square. Minutes later, he stood before U.S. Magistrate Sheila Finnegan, who asked if he understood the charge and that a conviction could carry a lengthy prison sentence. “Yes, your honor,” he answered calmly. “I’m not guilty of anything, and I’m trusting that when I have my day in court that will be clear beyond a reasonable doubt,” he said. The complaint alleges that as part of the extortion scheme, Burke solicited a campaign contribution for an unnamed politician. The Chicago Tribune and Chicago Sun-Times reported that Cook County Board President Toni Preckwinkle, a candidate for Chicago mayor, was the intended recipient of the contribution. Prosecutors told the judge that Burke, who has publicly opposed the National Rifle Association and proposed multiple gun-control ordinances over the years, had 23 guns at his offices alone. The judge said one condition of his continued release is that he gets rid of all his guns, including any at his home. He also was required to turn over his passport. The Democrat’s law firm, Klafter & Burke, represented the high-rise tower that bears President Donald Trump’s name. There’s no indication the case is at all tied to his firm’s work for Trump. He’s been on the council for 50 years and for three decades has chaired its finance committee, which makes key decisions about how the city’s budget is spent. Charges were filed in a complaint on Wednesday but only unsealed Thursday. A grand jury could still hand down a formal indictment, possibly adding new charges. The complaint, which does not identify the fast-food company or the executives allegedly squeezed, includes excerpts from wiretaps of Burke’s phone and emails seized in the raids. One intermediary told Burke he would tell one of the executives “how important you are” when he met the person for dinner. When the executives didn’t give Burke’s law firm the business he wanted, Burke spoke with one of his ward employees about how they would “play hard” ball with the company, the complaint says. Emails between the executives, who the complaint says are victims and not targets of the investigation, show how worried they were about the damage Burke could do to their enterprise. “I know these guys are very powerful and they can make life very difficult for all of our Chicago stores and I do not want to take this risk,” one email said after Burke forced them to halt the renovations. Burke joins a long list of Illinois lawmakers charged criminally, including former Gov. Rod Blagojevich, who is serving a 14-year prison term on multiple federal corruption convictions. Klafter & Burke specialized in property-tax appeals, with former clients that included Trump’s luxury tower in downtown Chicago. The Chicago Sun-Times reported in 2016 that the law firm saved the Trump building enterprise $14 million by appealing property tax bills over seven years. U.S. Rep.-elect Jesus “Chuy” Garcia and other Burke critics in Chicago’s Hispanic community have drawn attention to that tax work in a bid to hurt Burke politically. Burke’s wife, Anne Burke, is an Illinois Supreme Court justice. Ed Burke’s father was also influential in Democratic circles in Chicago until his death in the 1960s. Other Burke relatives also have been involved in Illinois politics. Burke is associated by Chicagoans with insider benefits long accorded aldermen. A city inspectors report in 2016 found snow removal crews plowed the street where he lived far more often than other streets after a 2015 snow storm. They worked his street 46 times in five days, the report said. Burke was a central figure in the mid-1980s during what came to be known as the “Council Wars,” a highly contentious time in Chicago politics when Burke and others opposed the city’s first black mayor, Harold Washington.